Shoot More and More Often. 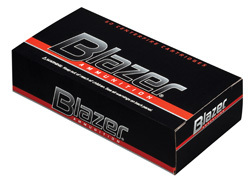 Blazer handgun ammo is everything you may need. Whether it be indoor range training sessions, maintaining those pesky pests or sport shooting from small game to casual plinking. Blazer is a great alternative to reduce the cost of practice shooting, while it continues to bring shooters quality and reliability. If you want great, dependable ammunition, without the high-end cost, think Blazer.